We are a family run coffee plantation located in the Pangalengan Highlands of West Java, Indonesia. We hire locally from our community and raise our coffee 100% organically. Of course, we follow the guidlines set by Fairtrade International! We strive to protect our earth and are always looking to implement the most environmentally friendly measures. We collect our coffee ONLY from wild luwaks (civets). We do not have many photos of the luwaks becasue they are nocturnal and very shy, but we did manage to catch a few snapshots. Many times these photos require a remote camera. Otherwise, you need a bit of luck and patience to find the hungry luwaks eating the ripest berries. If you would like a more in-depth look at our farm, please contact us! Luwak civet cats are semi arboreal - meaning they are comfortable both on the ground and in the trees. 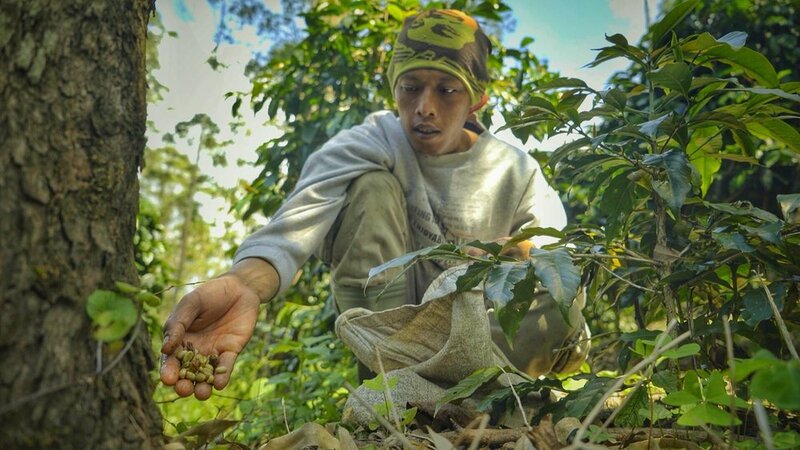 A kopi luwak "coffee hunter" searches for fresh remains from the civet cats. If the kopi luwak is not found within one day, it is less tasty and therefore we don't sell it. Our farm is high in elevation and requires a motorbike or small car to reach it. The farm is shade grown, which means it is embedded with natural trees. The trees allows numerous species of birds to live and therefore eat pesty insects that harm the coffee plants. This is one reason we can farm organically, the farm is in balance with nature and no one species grows out of control. After collecting the beans and washing them, they are sun dried for several days. After a many days of hard work, the collectors get a few days off to sip coffee and wait for the moisutre content in the beans to dip below 10%, the perfect exporet quality. A luwak cat goes in for the ripest coffee (kopi) cherry. A wild palm civet photographed at night enjoying a delicious meal on our coffee farm. The maximum of Kopi Luwak we produce in a month is around 30 KGs. It is usually much less. This is because the civet cats don't always congregate on our farm and we don't always find the coffee after the civets do their work. We also produce high quality arabica and robusta beans for our local community and for export in small quantities. As we grow our brand, we hope to share more varieties of coffee as well!